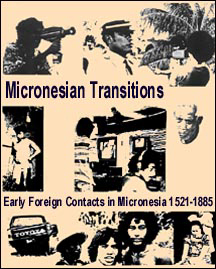 Part of the "Micronesian Transitions" videotape series from 1977 to 1983, this program relates the early history of Micronesia using slides, drawings, music, and narration from the perspective of Senior students studying at Xavier High School, Truk (Chuuk). They interpret the changes that have occurred because of foreign influences and the possible future status of the United States Trust Territory of the Pacific Islands. Producer: Xavier High School, Truk. Director: Eric Metzgar, Instructor. Senior Media Class Project: Peter Anoil, Nickson Bossy, Henchy Bualuay, John S. Deleon, Dennis Gaamed, Peter Halerumal, Ohner Jim, Kris Johnson, Iosta Lodge, Benly Lucios, Manuel Malichog, John Mootmag, Chrispo Orrenges, Jacinta Rickat, Julian Tewasilpiy, and John Waathan.